I would like to draw your attention now to Chopin’s Second Piano Sonata in B-flat Minor. Like the Ballades, the Second Piano Sonata is also inspired, albeit by the events of Poland’s troubled history. It is a fascinating and creative piece of music. 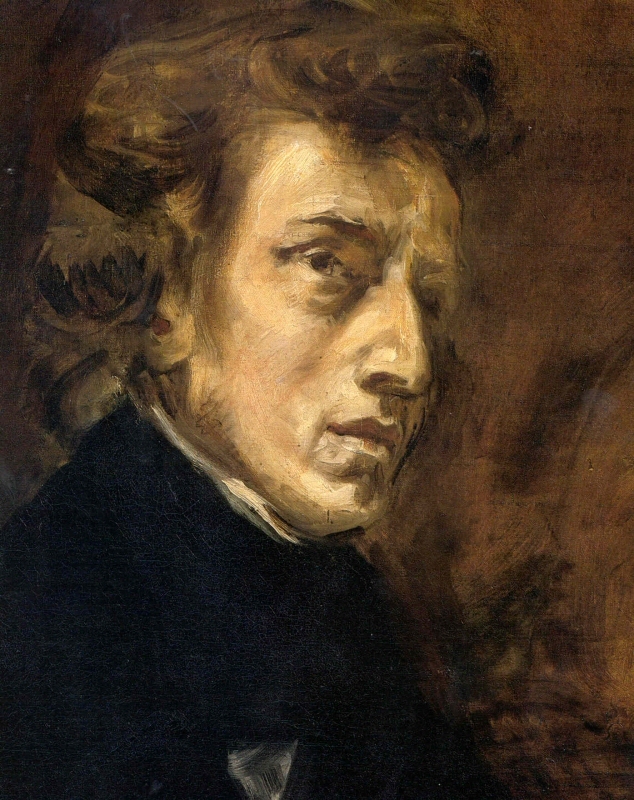 Chopin based the four movements of the sonata on four distinctive parts of Poland’s history. I first came across this piece of information as I was reading James A. Michener’s historical novel Poland. In this book, one of the characters, a Polish pianist gives a small talk to explain the meaning of the sonata after performing it. The first movement, Grave. Doppio movimento, symbolizes the difficult yet glorious first stage of Poland’s history. We hear strong and hard-to-the-ear chords which are to speak of the harsh wars and other conflicts, but we also hear beautiful melodic passages that are the consoling moments of Poland’s history. We hear the strong faith of the people, the poets, the musicians, the artists, and the intellectuals that have shaped Poland’s identity. Both the light and dark moments are strongly intertwined in the piece. The struggle between good and evil has always been a large part of Poland’s history. The second movement, Scherzo, is the dark and turbulent time in Poland’s history as Poland was taken and divided into three parts by the Russians, Prussians, and Austrians. Chopin highlights brutality in this piece through the use of powerful chord passages, but there is also a slow and beautifully lyrical moment in the piece; not all hope is lost. Historically speaking, Poland’s heroes were not idle during this time, as many tried to win Poland back. The piece, however, starts in chaos and ends in chaos. The third movement, Chopin’s famous Marche funèbre. Lento, speaks of the death of Poland. Once Poland was divided by the aforementioned powers, it was no more. For 123 years Poland did not exist on the map of Europe. But Chopin could not make this piece totally grim and desolate even given the circumstances, for he saw light in death. In fact, Chopin himself is a prime example of this. He was born on former Polish soil; he was taught the faith; he was taught the Polish culture and language; and he tried to contribute to this culture through his musical talents. Finally, we get to the fourth movement, Finale. Presto, non tanto. This is the Resurrection. Where there are many rests and breaks in the third movement, the fourth movement has not a single rest in either hand until the very last chord. It is pure movement; it is life! Chopin hoped and believed that one day Poland will be free and once again glorious. Indeed, Poland regained its independence in 1918, only to lose it again twenty-one years later to the invading Germans. Those short twenty-one years, however, were incredibly fruitful: with a vibrant economy, a high level of intellectual and cultural life. I would especially like to mention Poland’s epic victory in the Polish-Soviet War of 1919-1920 – known as “the Miracle on the Vistula” – over the Red Army as they tried to advance into Europe. To go beyond the meanings intended by Chopin, this sonata can also be understood as an allegory for the four stages of Jesus Christ’s active life. This comparison is also a creative way to find God in all things, and letting God accompany us in all things. The first movement is Jesus' three-year ministry: there are some turbulent moments, but it is generally marked with joy and goodness. The second movement is the Last Supper and the way of the Cross: the general “mood” of these two days is a heaviness of heart, sombreness, and chaos. Despite all this, there is light that emanates from the Institution of the Eucharist at the Last Supper and the victory over death through the Cross. The third movement is the burial of the Lord: I invite you to close your eyes as you listen to Chopin’s funeral march and imagine Jesus being taken down from the Cross and carried to the tomb in procession. Finally, Christ’s Resurrection is akin to Chopin’s hope for Poland’s Resurrection in the fourth movement. This is also strikingly similar to the dynamics of the Second, Third and Fourth Week of the Spiritual Exercises of St. Ignatius, with emphases on the public life of Jesus, his Passion and Resurrection, respectively. As you listen to Chopin’s Second Piano Sonata, allow yourselves to be touched by the drama of the history of Poland and the drama of Christ’s life, death and Resurrection as we approach the Holy Triduum. The Lord does speak to us through the beauty and creativity of music, for he is Beauty and Creativity itself. What stirs within you as you listen?